Gordon Giltrap with Carol Lee Sampson and Martin Green. For many years now I have been of the opinion that many of my tunes would make good songs (the Zombies being a prime example) or in some cases hymns. Well, this idea has finally come to fruition in the form of a Gospel album with lyrics supplied by my friend the Reverend Martin Green, who is himself a fine guitar player who has even built his own guitars, and the wonderful Carol Sampson. Carol is an outstanding singer songwriter and between her and Martin have transformed many of my pieces (ancient and modern) into modern day Gospel songs. The three of us found ourselves in delightful recording studios in the beautiful village of Bredon. Our engineer on the day was a young guy called Dave Draper, a brilliant engineer full of enthusiasm for all that he does. I look forward to working with him again. On a personal note, I believe that all music that touches us is of a spiritual nature and stands outside the confines of faith or religion. Those of you who have followed my career since the mid 70’s will know that I have always embraced and have been fascinated by projects of this nature. The Visionary album and The Brotherhood being I believe prime examples. This project is an extension of the journey. New Release on 12th January 2018. A bit like the proverbial bus, Gordon Giltrap’s recent albums are few and far between and then two arrive within a relatively short space of time. Last year’s ‘The Last of England’ was a triumph and reinstated Giltrap’s ascendancy in the world of acoustic guitar. 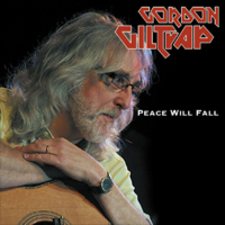 ‘Peace Will Fall’ – originally released in 2012 as ‘Echoes Of Heaven’ – is sufficiently different with Giltrap’s fretwork flourishes enhanced by Carol Lee Sampson’s vocals. Her warm style is not dissimilar to Magenta’s Tina Booth. This is an interesting departure for Giltrap as mostly his albums are instrumental but punters should be aware that, as is often the case, older songs are re-worked and given a new twist. So, for example, ‘Praise Him’ is actually ‘Roots’ whilst ‘Under A Blue Sky’ and ‘The Lord’s Seat’ will also be familiar tunes found elsewhere. ‘Sallie’s Song’ reappears as ‘Echoes Of Heaven’ with a narrated lyric, ‘Elegy’ becomes’ Walk Beside Me’. The overall spiritual nature of this album is reinforced by the presence of co-writer Rev Martin Green (yes, a real clergyman!) and the ambience. In fact, with the inclusion of another old chestnut – ‘Christmas Carol’ – this could be the festive album that arrived just a little too late. However, some may find the overtly Christian lyrics (conspicuously absent in the CD liner) a little cloysome. It seems that Giltrap is making up for a little lost time (and ill-health) reviving projects that germinated some years ago. With ‘The Last Of England’ he took up with a guy he’d first encountered at a car boot sale in the 1980s whilst this latest collaboration originated in a pub in Kenilworth in 2009.